There’s going to be a lot of talent on that stage on Wednesday…. The crew that brought you the 1st Mobb Deep show in 3 years (Ego Trip) and the man that held down the Stretch & Bobbito show after the guys retired (Sucio Smash) put together what should be another classic Hip Hop night in New York city. This is the 1st High Water Music show in over a year. High Water Music is the label that brought you DJ Spinna, Fresh Daily, Fashawn and more. 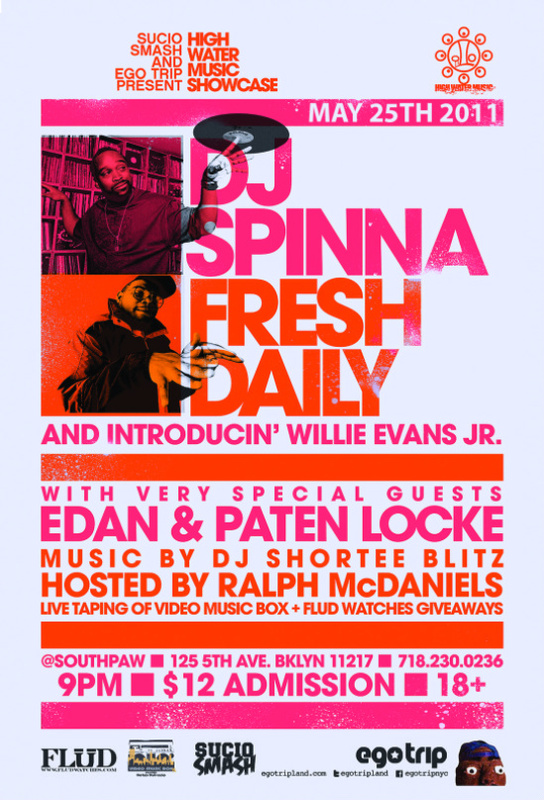 On wednesday they’ll be tearing down Southpaw with performances by DJ Spinna, Fresh Daily and Willie Evans Jr. Also a very special performance by Edan and Paten Locke. The night will be hosted by Hip Hop legend Ralph McDaniels and the whole event will be taped as a special episode of the classic show Video Music Box. DJ SpinnaFresh DailyHigh Water MusicSouthPawSucio SmashWillie Evans Jr.